Didn’t I just make this soup? 1. Sauté your alliums (onion, shallots, garlic, etc.) in butter and olive oil until soft and translucent. 2. Add your chopped vegetables to the pot, warming them in the oniony mixture. 3. Cover with water. Cook until tender. 4. Purée and adjust seasoning. Golden summer squash is in season right now. And it makes a soup the color of sunshine. 1. In a medium sauce-pan (about 2 quarts), heat the butter and the olive oil together over medium heat until it begins to foam. Add the chopped onion, and sauté it until it is translucent. When the onions begin to get a twinge of goldenness, add the squash. Toss and warm everything together for about another a minute or two. Make sure that the squash is well-coated with the onion mixture. 2. Cover the squash with about 1/2-inch of water. Add a few healthy pinches of salt, and simmer everything until the squash is nice and tender. When the squash is done, turn off the heat. Using an immersion blender, purée the vegetables in the pan (makes for easier clean-up). You want the texture to be smooth and creamy. If the soup seems a little thick, you can add some more water to thin it. Stir in the crème fraîche. Adjust the seasoning (I just use salt because I like to keep the vibrant color of the soup unmarred by little flecks of black pepper). 3. 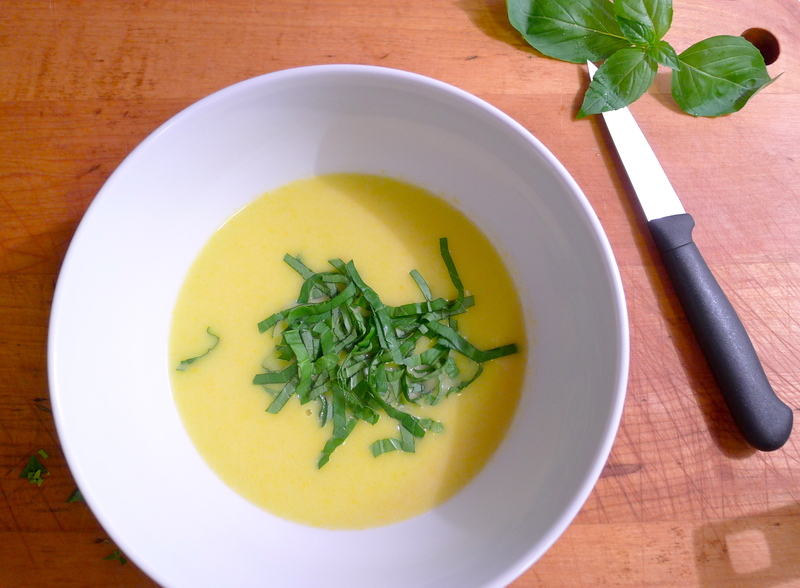 Top the soup with a chiffonade of basil, and serve it hot or cold. If you serve it cold, it will thicken upon standing.